There is nothing fancy to see here today folks. We had friends over last night and I didn't get to start doing my mani until 10pm. Which, for a mum of two, who needs to be at work by 8:30 is a very late night! 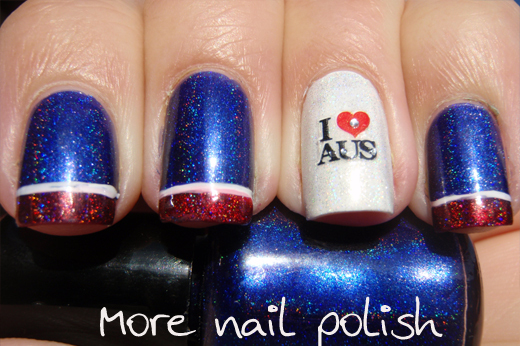 Thus, I did this real quick Aussie mani last night. The blue is a custom polish I made using polish tints and spectraflair. The tip is Ozotic 518. The white line was done with a nail art brush and white polish tint. The feature nail in Ulta3 Lily White with HITS Hefesto top coat. The nail sticker is one I got from a Kiosk at my local Westfield about two years ago. I've got something a little silly planned for tomorrow's nails, so I'm off to work on them now. Have a great night! 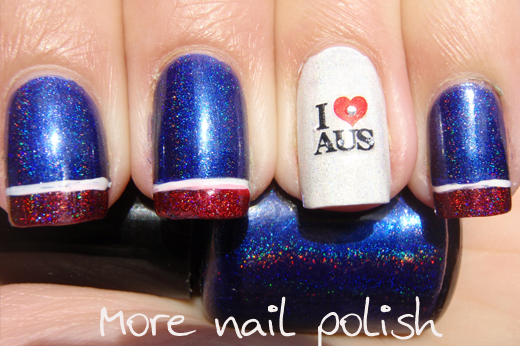 I love accent nails - thanks for keeping them coming. I'm enjoying your special week of inspirations. Okay now this is how you celebrate Oz Day, with holographs. 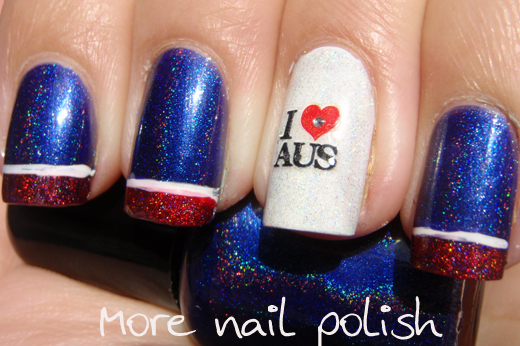 I think I'm gunna do something like this for Oz Day! Thanks for the inspiration! 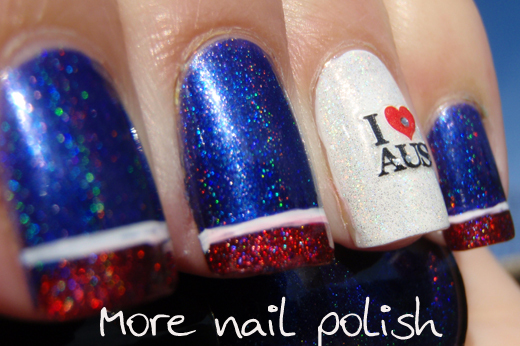 Great mani, love the holo polishes. Great combination, this is what I call great imagination and a lot of talent.